Elvis' Rockin' Birthday at "Rock-A-Hula®"
"Elvis" is in the building and ready to rock 'n roll at "Rock-A-Hula®" in Waikiki! Celebrate with dinner, super premium beverages, dazzling "Rock-A-Hula®" show and exciting Meet&Greet® featuring Elvis Presley tribute artist. 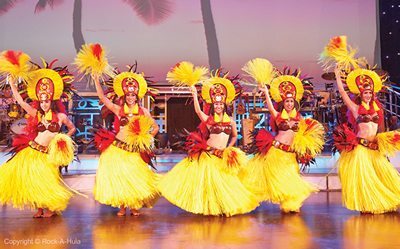 Three selections to choose from; all include gourmet food, Waikiki's biggest show® and souvenir King’s Scarf. Click here for our flyer.